The numbers are in and, during the Fall 2016 semester, Tip Whip’s 46 drivers transported more than 12,000 of their peers in need! That’s an average of over 800 student per week, or 114 students a day, who could have potentially made a life-altering decision if Tip Whip had not been available to get them to their next destination safely. And, this Spring semester, supported by our most recent advancements, Tip Whip will have the opportunity to provide even more rides to more students! As students get back into the swing of things after a long winter break, they will discover new mobile app features. Available to both Apple and Android users, Tip Whip app updates include: Where You At?, Color Coded Cars, Ad Space, and Surprise Promo Codes. The Where You At? feature is a landmark location feature that allows riders to identify their exact location including an apartment number or a local business. The Color Coded Cars feature gives riders a real-time update on car availability based on color; red cars are busy and green cars are available. The new Ad Space feature gives local businesses an additional chance to advertise and display their company. 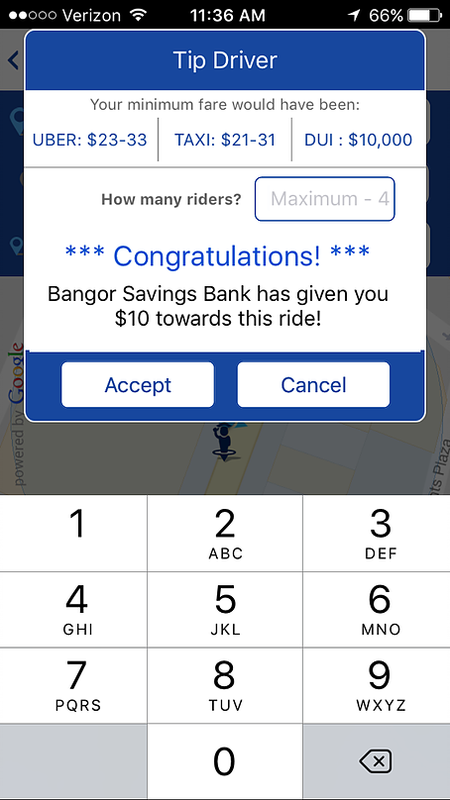 Finally, our biggest update, Surprise Promo Codes, a feature that will randomly select riders to have their ride sponsored by a local business who will cover their tip for them! We are also beyond excited to announce our first ever corporate partnership with Bangor Savings Bank! Their commitment to student safety is very apparent as they have committed to sponsoring 1,000 Tip Whip rides! Their sponsorship serves as a humbling reminder to the Tip Whip team that our whole community is rooting for all students to get home safely each night and is willing to invest a considerable amount of time, effort, and money into making that happen. Thank you to all who have invested in Tip Whip – be it emotionally, financially, or otherwise. It is because of your support that we are able to continue to grow and develop so that we can provide safe rides home to students in need. As always, if you are interested in getting more involved, please email us at Info@tipwhip.com.